You develop a special relationship with your smartphone when you have one. You come to rely on it for nearly everything and always have it with you so that you can phone, text, surf the Internet, use social media and more when you want to. You probably even keep your phone close by to you as you sleep in case you should need it. So what happens when that phone slips out of your hand, gets knocked off your desk or hits the floor when you are out at a restaurant and the screen cracks and shatters? You feel lost, devastated and worry about the hundreds of dollars it will cost to get a new phone. Instead of worrying about the fate of your phone, you can save your phone when you come to us at iPhone Repair West LA for iPhone screens repair in Los Angeles. Even screens that may seem like they are damaged beyond redemption can be saved when you come to us at iPhone Repair West LA. We are experts when it comes to screen repair and have seen everything from small dings and cracks to screens that are completely shattered and broken. With the expertise of our talented repair staff, we can help you salvage your iPhone. We can remove the damaged screen for you and replace it with a brand new one so that your phone looks new again. 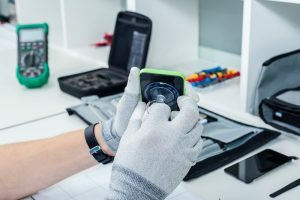 While the thought of bringing your phone to an Apple Store for repairs might make you cringe, when you come to us at iPhone Repair West LA you will get iPhone screens repair in Los Angeles that is fast and easy for you. When you come to see us, you can get your damaged screen repaired quickly, so you do not have to give up your phone for days at a time. You will not have to deal with long lines and crowded stores, hoping they can squeeze you in to perhaps fix your phone. Our fast repair service can get your phone back in your hands right away. If you need iPhone screens repair in Los Angeles or need your other cell phone, tablet or mobile device repaired in some way, see us here at iPhone Repair West LA. You can stop by our shop here in Los Angeles, fill out the contact form here on our website, or give us a call at 310-409-9666 and schedule service for your phone. We can help save your phone for you and restore it to perfect condition for you.